ABOUT THE ARTIST. 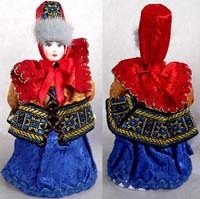 These dolls are from the last collection of famous Russian artist Tatyana Sokolova who lives in Moscow. Tatyana Sokolova is one of the best Russian artists who specializes in old Russian costumes. She graduated from Moscow Art & Theater University. Her major is Costume Designer. She worked with the most famous Russian costume designer Vyacheslav Zajtsev. Tatyana was always interested in the history of old Russian costumes. 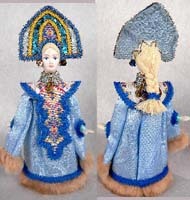 She is creating her Dolls in the costumes of different Russian ?guberniya? (provinces) of XIX century. In her work Tatyana pays a lot of attention to the smallest details of the costumes. Before doing any particular costume, she is studying about it and about that time and region in different old publications and museums in Moscow and St. Petersburg. Tatyana does not have any assistants; she is doing all work including smallest details by herself, except shoes, which are made by her father (he is a Master who knows old secrets). 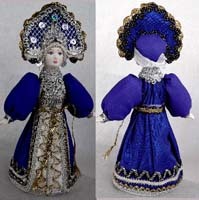 The process of making Dolls is very time consuming that is why Tatyana is able to do not more than 20-25 Dolls per year. The faces of the Dolls are hand sculptured of paper-mache according to the old recipe, which she found in the book published in XIX Century. Tatyana uses for her dolls? costumes only natural fabrics and, if possible, antique fabric from ?grand mother?s chests?. She makes by herself all necessary embroidery, laces, jewelry, etc. Tatyana Sokolova is well known around the Globe because of her unique work. She had very successful exhibits in USA, Belgium, Spain, France, Portugal, etc.